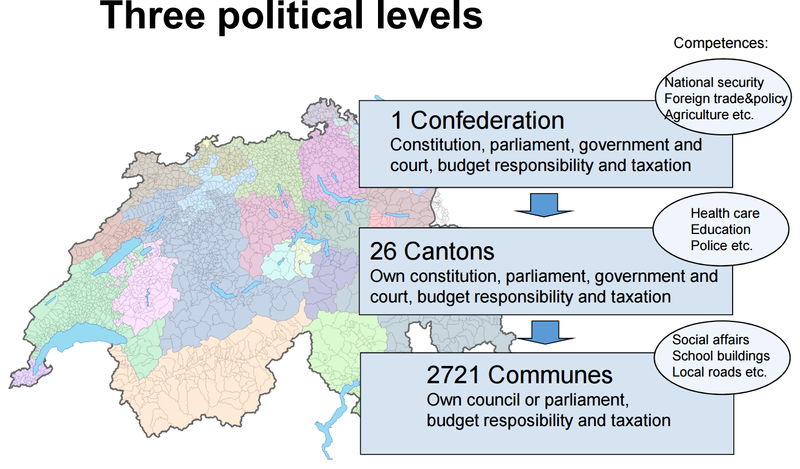 The Swiss have a very decentralised form of Government. This is such a major part of their governance and agriculture is such an outlier it’s worth a short note. The graphic here shows the main elements and their competencies. Each region can create taxes and appoint representatives to the various parliaments. When you consider that the total population of Switzerland is c8M there is a lot of democracy for quite a small population. Agriculture is one of very few federal policies. And even here the role of the Federal Office of Agriculture (FOAG) is quite focussed There are less than 250 FOAG staff. These officials are tasked with drafting, adapting and legislating agricultural policy. FOAG define the policy, the payment rates, the exemptions, the regulations, the fines, almost everything. The only areas of cantonal flexibility relate to setting priorities for landscape and biodiveristy. Both these programmes are 10% funded by the canton’s too. The canton’s do choose how they implement the scheme. So there are multiple systems farmers use to access the funding, some canton’s outsource the control and audit others don’t. Canton’s also feedback on how to improve the scheme, but much of the feedback relates to implementation. When asked why agriculture is so federal it’s clear there is a lot of history at work. But it seems to come down to the fact that agriculture is viewed as a strategic national priority and that retaining border tariffs and generous subsidies are considered federal responsibilities. For the UK, there is perhaps a lesson here. The canton’s have much greater responsibilities than the devolved nations but they accept that agricultural policy should be set nationally. Is there any reason why that doesn’t apply to the UK?